We are a full-service firm providing ecologically sound tree care throughout all phases of a tree’s lifespan. With a degree in Horticulture and over 20 years of experience as an ISA Certified Arborist, we tailor a management plan to meet the needs of your specific landscape. Understanding that a tree’s roots and shoots are naturally meant to be in balance and rely upon each other, our approach to tree care is based on science as well as aesthetics. Our adherence to International Society of Arboriculture pruning standards is your assurance we will safely manage the health of your trees. Knowledge of plant physiology and growth requirements means we will properly prune your landscape specimens. As a Qualified ISA Tree Risk Assessor, we evaluate your trees to maintain the safety of the tree as well as considering nearby targets such as people and property. Our knowledge of tree physiology and how trees respond to environmental stresses enables us to conduct thorough and efficient tree risk assessments. During construction activities, having a qualified arborist develop a preservation plan prior to excavation will help ensure the longevity of your trees by minimizing potential damage. We highly encourage consulting with an arborist prior to any groundwork begins, preventing damage is much better for your trees than mitigating damage after the fact. Young trees benefit from minor pruning in the early stages of life to establish the framework for sound structural integrity as the tree matures. As trees mature they may require pruning to remove dead, diseased, or broken limbs as well as building-clearance or size maintenance. While mitigating damage caused by wind, snow, or previous improper pruning, we focus on what is best for the health of your tree. 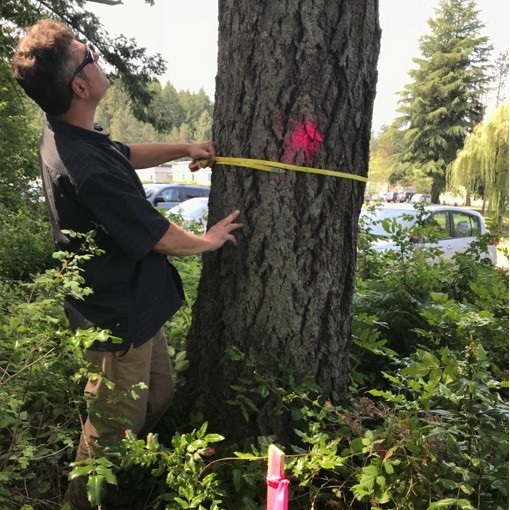 When removal of a tree becomes necessary, we help guide clients through the process of evaluation, providing arborist reports when required for permitting processes, obtaining permits as needed, and safely completing the removal process. Stump-grinding and replanting options are available and recommended. When a tree is lost it should be replaced.